Our next visit in this tour through the electromagnetic spectrum is the ultraviolet. You can’t see it, but anyone who’s spent a day out in the hot sun without sunblock has sure experienced its effects. Ultraviolet radiation is associated with the birth of stars and some of the hottest places in the Universe. Fraser Cain: Hi Pamela how was your conference? Dr. Pamela Gay: It was amazing. The folks at NEAF are a really great group and the stuff that they had there from all sorts of different brand new telescope designs from all the different manufacturers. They had solar observing set; they had all sorts of workshops throughout the weekend. It was really an impressive conference and I highly advise anyone out on the east coast to go to it next year. Fraser: You did a live question show? Pamela: I did a live question show. Fraser: Our next visit in the tour through the electromagnetic spectrum is in the ultraviolet. You can’t see it but anyone who spends a day out in the hot sun without sun block has sure experienced its effects. That’s sunburn. Ultraviolet radiation is associated with the birth of stars and some of the hottest places in the universe. So once again I guess we want to get our bearings. Ultraviolet is shorter wavelengths than the visible light that we can see with our eyeballs. Where does it range? Pamela: It in general starts right where the atmosphere starts blocking it at about 320 nanometers and then it goes all the way down to about 7 nanometers for the most extreme ultraviolet. Fraser: [Laughter] Seven nanometers. You just mentioned that it is blocked by the atmosphere. Pamela: This is probably a good thing. Once we start getting ultraviolet we’re dealing with damaging radiation from the sun. Luckily we have ozone in our atmosphere so up in the highest levels of our atmosphere the ozone just happily absorbs all of the radiation. It heats up and as the planet rotates it dissipates its heat back out and we’re able to be protected. While some UV still gets through at the longest of the wavelengths and still causes sunburn for the unprotected, in general we’re kept safe by the ozone in the atmosphere. Fraser: We look at our sun block it says that it is like UVA and UVB. How does that compare to the wavelengths? Pamela: The UVA is from about 320 nanometers longward to 400 nanometers. This is where stuff is getting through the atmosphere at a fairly good rate and the UVB is from 320 nanometers down to 290 nanometers at which point the atmosphere is pretty much opaque. We are starting to deplete the ozone in our atmosphere periodically thanks to fluorocarbons and other nasty pollutants so we do have to a fair bit about the UVA getting through but less about the UVB. But, it is the UVB that is more dangerous when it hits us. Fraser: Then but we’re definitely blocking out the stuff, the 7 nanometer stuff. Pamela: [Laughter] Yeah that has no hope of getting through our atmosphere. Fraser: What is the source of ultraviolet? What creates ultraviolet rays? Pamela: In general anything that is hot enough can generate ultraviolet. Our own sun doesn’t give off the majority of its light in these really high wavelengths but because it is giving off a curve of light it still has some emission that is coming out in the ultraviolet just like it has some emission that is coming off out in the radio. It is these high energy particles from our sun that we worry about the most. We also get ultraviolet light from different atomic transition lines. For instance in hydrogen one of the fundamental lines Lyman alpha is in the ultraviolet. We also get it from different atomic transitions and things like carbon and nitrogen. Fraser: When you say transitions, this is where an atom jumps from one energy level to another energy level and releases a photon? Pamela: That’s exactly what’s happening. You excite the atoms to a high energy state and the electrons jump up. But just like people can’t stay excited for a long time electrons don’t stay excited. Eventually they collapse back down to lower energy levels and in the process give off photons. For elements like carbon, nitrogen, oxygen, magnesium even iron to a certain point, many of these transitions are occurring in the ultraviolet. Fraser: That allows you to be a bit of a detective. You can look at some object, you can see in this case ultraviolet rays coming off of it at a very specific wavelength and that can help you figure out what process is going on with that object? Pamela: What’s even cooler about this is this particular set of transitions is very sensitive to temperature. We can look at the different strengths of these different transitions and know exactly how hot or how cool a given star is. We can use these transitions to measure temperatures as well as to measure the abundance which helps us learn: what was the chemical process that got to build that object. Fraser: Right and so you said that hot objects are responsible. Our sun is going from the radio all the way up to ultraviolet and beyond. More specifically if you’re going to want to do some ultraviolet astronomy what kinds of things are you going to be looking for? Pamela: In addition to seeing these high temperature, end of the black body spectrum we also were very sensitive to things like the transition lines in gas that is heated from 10,000 to about 100,000 degrees. This is where you have hot gas surrounding hot young stars. We start to be able to see star forming regions very well in the ultraviolet. Fraser: What about the dust? Does the dust block the ultraviolet? Pamela: Yeah dust is a problem but it is only a problem for part of the ultraviolet. This is one of the kinds of cool weird things about this. You do get a fairly significant amount of dust observed where right around 217 nanometers you have a peak in the absorption from the local dust. As you get to shorter and shorter wavelengths, the dust is able to just sort of blast its way right through the dust and so at the longer parts of the ultraviolet, we can’t see anything through the dust. As we look at the shortest part of the ultraviolet we start to be able to see through the dust. Fraser: Why are newly forming stars so hot? Pamela: It is not that all the newly forming stars are hot but it is that the star forming regions themselves are filled with young, young stars. Some stars in particular the hottest stars only live for a short period of time. If you want to see hot stars that only live for maybe at most a few million years you have to look for stellar nurseries. It is one of the tragedies in a way that these really amazing systems that are blaring away with massive amounts of mass loss giving off huge amounts of ultraviolet light live for very short times. They’re very disruptive to the other stars around them that will live more staid existences going on for billions of years. They blast away at the gas and dust and then often explode violently as supernovae. To see these young stars in action, these short-lived stars in action, we have to look at the stellar nurseries. Where we see ultraviolet light, that’s where these hot stars are and that is also where we’ll find star forming for the stars that will live much longer lives as well. Fraser: Right, okay so what else? Pamela: One of the other really cool things about ultraviolet is we start to be able to test our theories for the big bang. We talk a lot about how during the first three minutes there was basically the entire universe acted like the inside of a star. There were a lot of different nuclear reactions going on. It gave us helium, trace amounts of lithium and beryllium. One of the things that we don’t talk about very much is it also gave us deuterium. It gave us a heavy form of hydrogen that has both a proton and a neutron in it. In general during these nuclear reactions, deuterium is just an intermediary product. It is just something that happens at a halfway through step and then it quickly gets turned into something else. When the entire universe pretty much stopped having nuclear reactions all at once some of the reactions weren’t seen through to completion. All of this deuterium that was getting formed as an intermediate step was left behind when the nuclear reaction was turned off. That deuterium is still there and over time within stars, the deuterium is getting destroyed. We can look through and we can see the atomic transition lines from deuterium separate from hydrogen in the ultraviolet. Their wavelengths are slightly different because their masses are slightly different. We’re able to look back and measure the ratio of deuterium from hydrogen as it is decreased over time and through the evolution of the universe. Fraser: That’s just another independent line of evidence that we can trace back to the big bang. Pamela: We have our predictions on how much deuterium should have been there. We’re able to go back and determine that’s exactly what we see. Fraser: Wow. I’m guessing that it is great for around super massive black holes, right? There’s so much energy, so much temperature there. Pamela: This is where we start to see things like what is referred to as the blue hump in the light from active galactic nuclei from galaxies that have all sorts of feeding processes going on with their super massive black hole. All of the energy is causing the inner parts of the ecretion disc to give off vast amounts of ultraviolet radiation. It is really cool to look at galaxies in these really hot wavelengths because you see the core activity. You see the noddiness of the star forming in the arms. It is as though you’re seeing the galaxy in just its most interesting parts in some ways, its most energetic parts. Fraser: Right if you looked at a galaxy in visible light it might look kind of bluish or more reddish. 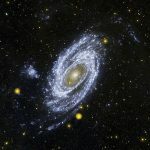 If you look at a full galaxy in the ultraviolet, if it is undergoing a lot of star formation, it is completely different from a more regular galaxy. I guess a lot of the times because there is a lot of star formation happening that indicates that something recently happened, there is some kind of trauma to the galaxy? Pamela: When you see unusually large amounts of star forming. Some galaxies are just naturally still undergoing star formation. Our own Milky Way still is naturally undergoing star formation. When you look at things like the Mice, like the Antennae, these colliding systems in the ultraviolet you see massive amounts of star formation. What’s neat is as you shorten the wavelength that you’re looking at these galaxies in what you see is they go from these big dusty red things and then you strip away the red light and the arms get a little bit smaller. Fraser: That’s like the bones of the galaxy. Pamela: Yeah, it’s very much of a skeletal system. Fraser: What about planetary astronomy? Is that any good here in our solar system? I suppose the sun – there is a lot of research done on the sun. Pamela: We look at the sun, we look at the reflections that we get in the ultraviolet off of the other planets and that helps us understand by how they’re reflecting different things what that tells us about the surface chemistry. Different things emit at different wavelengths. In general, ultraviolet isn’t the most interesting of things for looking at planets. It is mostly something that we use to try and understand the hydrogen, to understand the distribution of different atoms in distant galaxies. In fact with galaxies we desperately have to use the ultraviolet to be able to find the most distant systems. Fraser: Let’s talk about gear then. What does a telescope designed to capture ultraviolet radiation look like? Pamela: Yeah, we use photoconductors that are like CCDs but we have to be very careful to block out what is called red leak. This is where you start getting the visible spectrum light leaking in. Detectors are very, very sensitive to red light, to visible light which is all red compared to the ultraviolet. You have to very carefully reject all of this light from entering the detectors. One of the problems that we deal with is that we’re very good at building photocathodes that are sensitive to the ultraviolet. Even though they’re sensitive they aren’t nearly as efficient at capturing that light as the detectors we use in the optical. In the optical we’re able to get what we call quantum efficiency, the number of photons that get turned into a signal that makes a pretty picture. In the visible light we’re often able to up to 90% of quantum efficiency. When we’re using photocathodes in the ultraviolet we’re only getting 20-40% efficiency. We’re losing a whole lot of light. Detectors in the ultraviolet are also much more sensitive to dirt and irregularities in the surface. We have to build much cleaner, much more everything; fewer surfaces for instances. In the visible you can knock your light around 2 or 3 times and you’re not going to sweat it too much. But in the ultraviolet you want to use as few surfaces as possible. In every reflection you end up losing some of those photons and every photon is precious in the ultraviolet. Fraser: Right and this is the big problem. We’re here underneath the Earth’s atmosphere. That’s great because we don’t get lots of really terrible sunburns or horribly irradiated [Laughter] but it is really bad because you think that the atmosphere is bad for a regular telescope, it is awful for ultraviolet. Could you just take the standard telescope, a big research telescope and pull off the CCD cameras that are used for regular visible light astronomy and bolt in the UV equipment and it would work? The telescope is the same thing? Pamela: At the most basic level yes. Some surfaces are better than others. Silver vs. aluminum becomes a question but yeah a good reflecting telescope. Especially if you have your detector up at prime focus so you’re only looking at one reflection that would work. But you have to get above the atmosphere. We’re always launching these suckers into space. Fraser: The true enemy of the ultraviolet astronomer is the atmosphere. Pamela: While we’ve had this whole series of really good missions, they was GALAX, FUSE, EUVE – the extreme ultraviolet explorer, Hubble space telescope does amazing work in the ultraviolet. But all these missions are temporary and we have no plans to replace any of the current missions in the future. We’re reaching a point where we’re not going to have the ability observe in the ultraviolet anymore. Fraser: What are some examples, you just sort of went through them pretty quickly? GALAX, FUSE and Hubble those are sort of currently operating UV telescopes? Pamela: FUSE is dead. It died a few years ago. Its last sad little servo finally bit the dust. GALAX only lasted 29 months so it is also a past-tense mission as well. Ultraviolet explorer is a past-tense mission. Hubble is the only one up there that is currently actively taking ultraviolet images. Assuming all goes well with the upcoming Hubble servicing mission, it has a few more years of life left in it. Once that is past, there is nothing on the books currently to replace it. Pamela: We’re about to lose the ultraviolet and this is frustrating because there is some data like looking at Lyman-break galaxies that we can do a lot of work thanks to red shift. We can do a lot of work in the visible when things are very far away but as we start to look at nearby systems we’re losing all of that information. Fraser: I guess that was going to be sort of leading into my next big question: if money were no object and the most wonderful ultraviolet observatory could get launched, what would astronomers want to be looking for? What deep questions would the ultraviolet help us answer? Pamela: Ultraviolet in addition to helping us trace out deuterium abundances over time also helps us understand where all the hydrogen gas is. Where is all the absorption taking place? Lyman-break galaxies we generally talk about these things when they’re at red shifts greater than 2.5, when they’re several billion light years away. These are systems where when they start emitting hot light that light gets absorbed at 912 nanometers by hydrogen gas. This is the Lyman alpha transition. So you see in the light coming off of the galaxy this nice pretty curve, pretty curve and then it just drops. What’s neat is when you look at these things in different wavelengths you see pretty galaxy in red, green, you see nothing in the ultraviolet. By seeing this difference where it is there in the visible, it is there in the visible and then it goes away and in the ultraviolet we’re able to locate very quickly, very easily where distant galaxies are located. What are also cool are distant objects giving off light, that light passes through clouds of gas between us and those distant galaxies. As that light passes through random isolated clouds of hydrogen gas, clouds that have no stars in them, clouds that never bother to form galaxies or star clusters or anything else, those clouds of gas that are intervening, absorb out light in the Lyman alpha creating what is called the Lyman alpha forest. We can map out where these pockets of cold gas are located throughout the universe by looking at how they absorbed this ultraviolet light. Fraser: Then knowing where the cold gas is – the cold hydrogen gas is the stuff that stars eventually get made of – this is the stuff that is left over from the big bang? It is kind of like it is the raw material that has never been used. Knowing the amounts and knowing the locations and the percentages of this gas compared to a galaxy will tell astronomers how long galaxies can go how fast they’re going to be forming stars, all kinds of things. Pamela: We don’t get to all of that information just from the ultraviolet but at least it helps us figure out. One of the questions with dark matter is how much of it is just stuff that’s cold? This allows us to find where all the pockets of cold normal matter and when we find them they don’t add up to the missing dark matter. Fraser: When we talk about how much of the universe is unknown we talk about the 20-something percent dark matter and the 70-something percent dark energy and of the 4 percent of matter, half of that is missing as well. [Laughter] So it is regular matter, we just can’t see it. That could be this cold hydrogen. Pamela: As I said before you use ultraviolet to very carefully measure temperatures, to get at chemical abundances. It allows us to get at things like why is the Veil nebula such a pretty purple color? It is because of the oxygen in it. We’re able to get at different information about the compositions of nebula, the compositions of stars only because we have access to the ultraviolet. Fraser: I think that one of the greatest space photos in my opinion is an ultraviolet image. I think it was taken by FUSE of the star Myra which has this huge long glowing tail almost like a comet. FUSE built up this image of Myra. We’ll be able to link to that in the show notes. Was there anything else on ultraviolet that you thought should be brought up? Pamela: Nope, it is a fairly dangerous wavelength and we’ve now hit the bad for life part of the electromagnetic spectrum. Fraser: Yes, so next up x-rays. Pamela: Yeah, welcome back to death and destruction. Fraser: Sweet, that’s what we like. We’ll talk to you for the next show. I love your show! I listen to it for hours doing art hotography editing.